Cooking greens range from the very tender and quick-cooking spinach to the hearty fibrous varieties of kale. Learn about the difference, similarities, and cooking tips for lots of greens. Beet greens are almost only available when attached to freshly dug beets. Beets with their greens attached are one of the great deals (two for one!) of buying vegetables at farmers markets. If you don't cook them that same day, be sure to separate the greens from the beets and store them separately. The beetroots will continue to drain energy from the beet greens if you don't. Even with this precaution, beet greens don't stay fresh very long, so you'll need to use them within a day or two. Use them as you would chard leaves but note that the greens from red beets will stain things (including lighter vegetables) a lovely shade of pink. Or use them with the beets they helped grow in a beet greens salad. Collard greens are mild, earthy, and delicious when treated well. They have broad leaves with solid, firm veins running through them. They have a strong, vegetal flavor and a remarkably hearty texture. They don't break down easily, so they are good to use when you want a green that doesn't lose its shape and texture. Before you cook them, you need to buy them. Look for dark green leaves without any yellowing, browning or wilting. Collard greens should be quite stiff, almost like fans. Store collard greens like all greens, wrapped loosely in plastic in the fridge. Rinse them thoroughly before using them. Collard greens are famously good when cooked with smoked meats, bacon, or sausage. Garlic, chiles, and anchovies are other strong flavors that stand up to and bring the best out in collard greens. Traditionally, collard greens are cooked an exceptionally long time, at least an hour if not more which is a process that fuses the flavors of the greens with cooking aromatics or liquids. If you don't want to cook them that long, you can try blanching them first and then sautéeing them like spinach or chopping them up and adding them to soups. You can also use them, once properly cooked, in dishes like Greens With Yogurt & Cumin. Curly kale has broad leaves with wonderfully curly edges that are a deep green color. Kale is usually cooked a long time or blanched in salted boiling water before being used to tenderize it, reduce its bitterness, and set its beautiful color. The hearty nature of kale helps it stand up to long cooking times, making it a great fit for dishes like Greens With Pepper and Ginger. Yes, dandelion greens are the green leaves from the pesky lawn and garden intruder. They are earthy, nutty, and bitter. They have a sharp flavor much like radicchio but more so. The variety of dandelion green cultivated for sale at markets and grocery stores is milder than the intensely bitter and mineral-tasting garden weed. Those "weeds" are perfectly edible if you want to tame their bitter attitude. At the market, look for stiff leaves with pointy, fine "teeth." Avoid any bunches of dandelion greens with any yellowed leaves or slimy stems. In the garden, choose perky green leaves and only use leaves from lawns and gardens that aren't treated with pesticides or other harmful chemicals. For people who find the bitterness of dandelion greens a bit much, you can always blanch them (cook them briefly in boiling salted water), squeeze the water out of them, chop them and lightly braise them with strong flavors like bacon, garlic, and chiles. Dandelion greens are also lovely served slightly wilted in warm salads as long as a strong red wine or sherry vinaigrette and/or rich flavors like a poached egg, toasted nuts, or grated cheese round out their flavors. Try dandelion greens in place of frisée in a classic French bistro salad or in place of escarole in a salad with roasted beets. To soften the sharp bite of dandelion greens, slowly simmer or braise them with some bacon or pancetta. Like turnip greens and beet greens, kohlrabi greens are the leaves from a vegetable that are tremendously, deliciously edible. Like beet greens, they are usually only available when sold attached to the vegetable in question. Use them in place of any hearty cooking green or cut into thin ribbons and serve with a strong dressing as a salad. 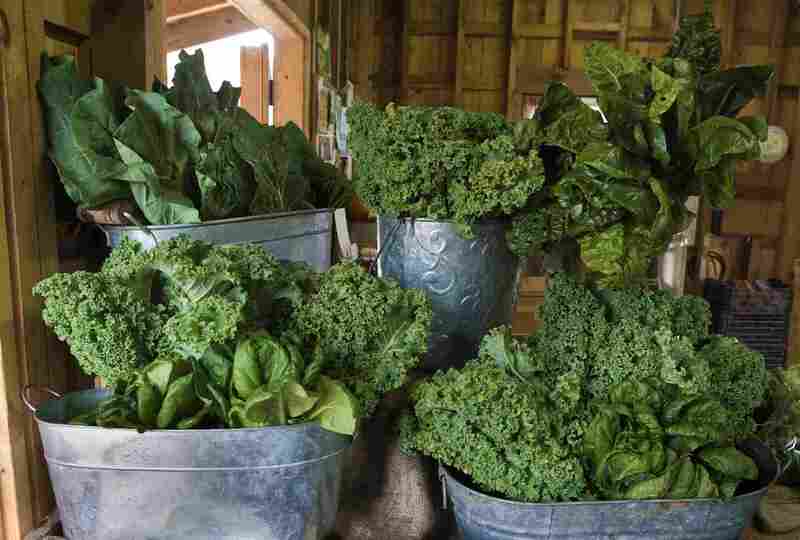 Dino kale, also known as Tuscan kale, lacinato kale, black kale or cavolo nero, is an incredibly hearty cooking green with dark, dark almost blue-green or even black-green leaves and lots of earthy, nutty flavor. The leaves are so hearty that even when well cooked they retain a wonderful firm texture. Look for the biggest bunches with the widest leaves you can find. You want very dark blue-green or black-green leaves with no brown or wilted bits. Store dino kale loosely wrapped in plastic in the fridge. When ready to use, be sure to rinse the leaves well. Unlike more tender greens, dino kale doesn't store better if washed first. The leaves are so sturdy that you don't need to be nearly as careful to avoid bruising and crushing as with other greens. No need to beat them up, but also no need to tenderly place them on top of the bag for the trip home. Dino kale is particularly well suited to braising in a bit of broth. Or simply blanch it in boiling water and then sauté it in olive oil with garlic and a chile or two, if you like. A sprinkle of salt and a squirt of lemon are nice, too. Mustard greens are the greens of the mustard plant. The leaves have a sharp, bright flavor that may just remind you of mustard seeds at their greenest and most piquant. You can mellow the flavor by blanching them in salted boiling water for a minute or two, draining, and then using them. Or sauté them as-is for a sharper flavor. Pea greens, a.k.a. pea shoots, are the green vines that yield green pea pods later in the season. Look for these tangled masses of greens in late spring and early summer as farmers prune back their green pea plants and bring big tumbled masses to farmers markets and Asian markets. Some specialty markets are starting to carry them, but they are not well suited to traditional supermarkets since they go bad so quickly. Look for bright pea green vines with fresh, vibrant looking leaves. Avoid vines with brown or mushy ends or damaged leaves. Pea greens should be used within a day or two after buying them. Store them loosely wrapped in plastic in the refrigerator. Pea greens are at their best simply sauteed in a bit of olive oil or grapeseed oil. Some browned garlic or shallots add a nice bit of sweetness, and a squirt of lemon juice at the end highlights the bright, clean flavor of pea greens. Pea greens are also delicious added to soups, where their great leafy volume cooks down into lovely green ribbons. Before cooking pea greens, look them over and cut or snap off any tough ends. You can cut them up to make them easier to eat after they're cooked. Pea greens cook down in volume a tremendous amount, up to 90 percent. To cook them for a large group, you may need to cook them in several batches. Rainbow chard is a mix of Swiss chard, red chard, and golden chard. Use it as you would any other chard, but beware that bunches that contain red chard will bleed just as red chard does and stain lighter vegetables pink. As with all chard, you can remove the center ribs prior to cooking. Red chard is like Swiss chard but with red stems and ribs. The chard-beet connection (they are extremely close relatives) really comes forward and gives red chard an earthier flavor than Swiss chard. Use as you would Swiss chard, but beware that red chard will "bleed" red. Red mustard greens are pretty much just like green mustard greens except they have a pretty red tinge to them. Baby mustard greens are fabulous in salads and the red ones add a lovely hue. When cooked, red mustard greens lose their distinctive color as well as the sharp edge of their flavor. As with green mustard greens, you can mellow the flavor by blanching them in salted boiling water for a minute or two, draining, and then using. Or sauté them without blanching first for a sharper (but still mellowed) flavor. Longer cooking leads to an increasingly mellow flavor. Russian kale looks a lot like curly kale, but it has a bit of a red blush to it. Use it as you would any other kale, but be warned that it can leave a slight pink tinge to white and other lighter-colored dishes. Spinach is the quickest cooking of the greens listed here. Unlike other cooking greens, spinach is commonly eaten raw as well as cooked. Use in a salad such as blueberry blue cheese spinach salad or toss it into soups. Sweet potato greens have a lovely, almost sweet flavor. They have no discernible bitterness, and certainly none of the astringency one finds in chard or spinach. They work well in soups or stews or simply and quickly sautéed in a hot pan with a bit of oil and a sprinkle of salt. Swiss chard has very dark green leaves punctuated by bright white stems and ribs. The ribs are often cut out and used separately, either in the same recipe or for use in a different recipe (roasted chard stems are delicious). The leaves are scrumptious simply sautéed; the ribs require a bit more cooking and are often boiled to tenderize them before being used in gratins, casseroles, and other dishes. They can also be used much like celery, chopped and sautéed to add flavor to soups and stews. Turnip greens are the greens of turnips. They are usually sold on their own and bunched like collard greens, but you can sometimes find them still attached to turnips. They are a mild, easy-to-use green that cooks quickly. Add to soups, stews, or simply sauté them for a quick side dish.